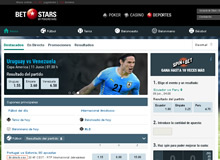 Betfstars is the betting brand launched in 2016 by the poker giant PokerStars. It has been able to offer a variety of bets comparable to that of most online sportsbooks in a shor time. The offer of bets is more than correct taking into account the time the house has been operating, adn the best thing is that Betstars is commited to improving it day by day. The customer service works 24 hours per day, 7 days a week, being the only way of contact the email or the form on your webiste. Betstars betting account allows you to enjoy poker and casino in an integrated manner, which is especially useful in case of poker because PokerStars is the largest community in the world in this mode. Betstars has a welcomed code for new users and condominums for existing users.